On October 3, Prince Max of Baden (Kaiser Wilhelm's cousin) was sworn in as the chancellor of a new parliamentary government. The chancellor was now responsible to parliament rather than to Wilhelm. The question of war and peace was the responsibility of parliament – representatives of the German people. Two members of the Majority Socialist Party were included in the new government in minor cabinet positions, despite the Socialist Party being the largest party in parliament. On October 4, the new government sent its request for an armistice to the Allies. Feeling no sense of urgency, Germany's parliament then went into recess until October 22, while the necessary legislation for new government powers was being drafted. The British broke through the Hindenburg Line on October 5, but the Germans merely pulled back a little and halted the British drive. This cheered Ludendorff. 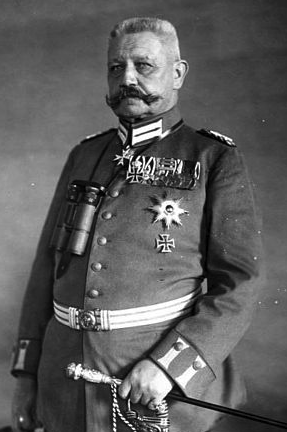 And Ludendorff was encouraged by reports of diminishing strength in the force of Allied attacks. No record exists of any regret by Ludendorff, or recognition, that German strength would have been much greater had he held to a defensive strategy from the beginning of the year. Wilson's reply to the German request for an armistice arrived in Berlin on October 9. Wilson asked whether the new government spoke for the German Empire and if so whether it was prepared to accept his Fourteen Points unconditionally. A German submarine sank a mail and passenger ferry, the RMS Leinster, off the coast of Ireland, killing 564 passengers and crew including US servicemen and 130 women and children. An angered Wilson sent another note, dated October 14, demanding that Germany immediately evacuate occupied lands, end its submarine warfare, guarantee constitutional reforms and transform Germany into a democracy – a polite way of demanding that Wilhelm abdicate. Wilhelm responded to the note by calling it "unmitigated frivolous nonsense." And he called on his cousin, the chancellor, to "arouse the entire people to rally round their emperor in defense of their sacred heritage." In the United States, labor leaders agreed that the United States should settle with Germany rather than fight for "the imperialist aims" of Britain, France and Italy. Republican Senator Henry Cabot Lodge was on a different course. He had recently introduced a resolution in the Senate calling for no further communication with the Germans except a demand for unconditional surrender. Senator Hiram Johnson of California joined Lodge in favoring a German surrender, and he joined others, including Theodore Roosevelt, in repudiating Wilson's Fourteen Points. Another Senator, Miles Poindexter, labeled Wilson's position on ending the war a "crime against humanity." And President Wilson, feeling the pressure of public opinion and believing that Germany was still in the hands of its "military masters," was close to demanding unconditional surrender by Germany. By mid-October Ludendorff and Hindenburg wanted to distance themselves from a negotiated settlement or from surrender to Allied demands. Now Ludendorff was for fighting on the defensive – through the coming year,1919. He and the German admiralty insisted that submarine warfare continue. The Great Pretender, Paul von Hindenburg in 1916. He was a go-along dullard during the war, but he would be respected enough to go far in German politics to his death in 1934. On October 20, Hindenburg told Prince Max that his government should keep Germany fighting "for our honor to the very last man." A third note arrived in Germany from Wilson on October 23, with Wilson demanding that if Germany's military masters, including Wilhelm, were still in power, they had to step aside. He said the US would negotiate only with representatives of the German people. On October 26, during a shouting match between Wilhelm and Ludendorff, Ludendorff resigned, complaining later that Hindenburg, who was present, had made no attempt to defend him and was therefore guilty of treachery. Germany's parliament, in session as scheduled since October 22, adjourned again until November 9. Meanwhile, on October 30, the Allied powers signed an armistice with the Ottoman Empire. That same day, Germany's admiralty launched a plan that had been known outside the admiralty only by Ludendorff. The plan called for the German fleet to make a great assault against the British Navy – for the sake of German honor. Germany's enlisted sailors were ready to fight to defend the homeland but not for a mere gesture. Risking the punishment of death for mutiny and treason, the sailors with the fleet harbored at Wilhelmshaven (20 miles west of Bremerhaven) rebelled. In the following four days the revolt spread to the fleet harbored at Kiel. From there it spread to troops stationed at Kiel and to the civilians there. Then it spread throughout the coastal towns of northern Germany. By November 8 it had spread to all major German cities. Councils of workers and enlisted military men arose – as had occurred when Russia's tsar was overthrown. A rebel group of socialists took power in Munich and proclaimed Bavaria a democratic republic. Its success was not a result of its popularity but of confusion and no one else having taken power. In some areas, councils of military men arrested their officers and sought the army to recognize committees of enlisted men. In city streets, pent-up resentment against military officers was released in attacks on officers in uniform. People who had felt obliged to step off sidewalks to let German officers pass now spat on them. Hindenburg was still Chief of the German General Staff, and as a sentimental supporter of the German monarchy he was unable to tell Kaiser Wilhelm that he, Wilhelm, had no support. So Hindenburg had his adjutant, General Groener, tell Wilhelm for him. In Berlin, the chancellor, Prince Max, acted on his own and announced the abdication of Wilhelm and his sons. Then Max resigned as chancellor, handing the government to the leader of the Social Democrats, Friedrich Ebert. That same day, November 9, the socialist leader Karl Liebknecht was exuberant in his reaction to what appeared to him to be a revolution in the making. Liebknecht had just been released from prison where he had been serving a sentence for opposition to the war, and he proclaimed Germany a socialist republic. And Ebert, who despised revolutionary socialists, countered by declaring Germany a "Free German Republic" – while some German patriots disliked both kinds of socialists and recognized no difference between them. Kaiser Wilhelm refused to accept what he called a coup d'etat. But he was as powerless as his cousin Tsar Nicholas had been. On October 10, at Groener's and Hindenburg's insistence, Wilhelm boarded his silver train and left Spa for Holland, never to forgive Hindenburg for what he called his disloyalty. On November 10, in a French forest in Compiègne, a German and French delegation met to arrange an armistice. The terms of the armistice were that Germany was to withdraw from all "invaded countries" and Alsace-Lorraine within fourteen days, and the Allies were to occupy German territory on the left bank of the Rhine. Furthermore, the right bank of the Rhine River was to be neutral territory; the economic blockade against Germany was to continue; German forces were to evacuate East Africa within a month; Germany was to surrender to the Allies most of its navy (ten battleships, seventeen cruisers, fifty torpedo boats and over a hundred submarines); and Germany was to surrender 5,000 artillery pieces, 30,000 machine guns and 2,000 airplanes. Although Chief of the German General Staff, Hindenburg wanted to avoid attending the signing of the armistice. He prevailed upon a member of Germany's Center Party, Matthias Erzberger, to lead the German delegation. Erzberger was a Roman Catholic and had been a critic of the war. On November 11, Erzberger signed the armistice. No German officers signed the agreement. Hindenburg's military distanced itself from what to some Germans would appear to be capitulation. To some Germans immersed in simplistic thinking it would now appear that civilian politicians and Marxian Social Democrats had stabbed Germany's army in the back.